All told, the Volvo S40 and V40 sports pack gives these cars a distinctly sporty profile. This is also the first time that 17" wheels are available on these Volvo models, and the sporty Arcadia wheels, shod with 215/45 ZR17 Continental Sports Contact 2 tyres, are only available as part of the sports pack. The sports chassis with Nivomat body levelling is fitted as standard in this version. Three colours are available: Silver, Sapphire Black and Virtual Blue, all metallic. The lower sections of the front and rear spoilers and the sills are painted in a contrasting colour, Titanium Grey metallic. Colour-matched side trim mouldings, side marker lights with white glass lenses, black headlamp bezels and black inlays in the front spoiler complete the exterior treatment of the sports pack. The discreet black interior trim features seats upholstered in a combination of textile and leather, known as Vega. The new instruments introduced on the Volvo S40 and V40 in mid-2002 are further highlighted in the sports pack with an aluminium bezel around each gauge. The aluminium theme is repeated in the new sill plates that bear the Volvo logo. 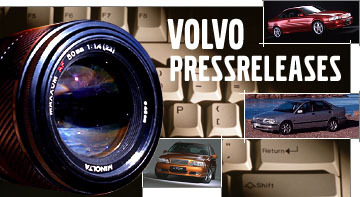 The sports pack for the Volvo S40 and V40 will be produced in a limited edition starting in February 2003. The exact contents of the sports pack may differ from one market to another.